At first, Reiner Moll, head of the “Privatinstitut für Naturheilweisen Arkanum“ (Private Institute for Naturopathy) in Neusäß near Augsburg in Bavaria, was skeptical: A cure- all? Meanwhile, after almost one year of practical application, he has experienced treatment successes he can’t explain: “All kinds of chronic disease, states of pain, and skin diseases can be alleviated or even completely cured.” For instance, the rashes of a 32-year-old man from which he had suffered for five years vanished within a fortnight after rubbing them with the gold medicine. Another patient who was restling with the consequences of burns she had incurred fifteen years ago also recovered after two weeks. A 48-year-old aviation engineer who suffered from severe chronic bronchitis and could hardly speak any more was free from pain after one week and was able to talk normally again. “On the whole, patients feel vitalized, their organism regenerates, their mind becomes more stable”, Moll sums it up. 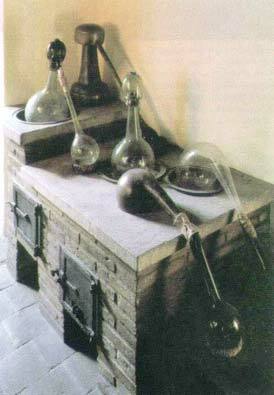 “Aurum potabile”, the drinking-gold of the alchemists, is a medieval medicine which was praised enthusiastically back then. The instructions for its preparation have been lost, though; only fragmentary allusions and descriptions in symbolic code have remained. 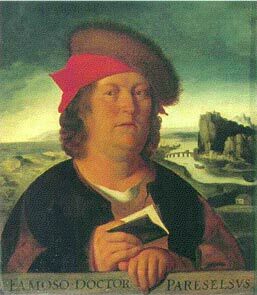 For instance, the famous medieval German physician and alchemist Paracelsus (1493-1541) raved: „Of all Elixirs, Gold is supreme and the most important for us, for it can keep the body indestructible. Drinkable gold will cure all illnesses, it renews and restores.“"
In his writings, Paracelsus alleged to have cured the most diverse chronic illnesses and many hopeless cases. He also said he had taken it as a prophylactic measure and so protected himself against infections like the Plague. Furthermore, it was possible to detoxicate and purge the whole system with it: Over the course of everal months its ingestion would thoroughly cleanse all “juices”, regenerating the blood, the cells, and thus the whole organism, the traditional reports allege. Nowadays there are homeopathic gold medicines that contain gold information, and there are preparations from gold colloids containing very small gold molecules. In addition, medical research has shown that even small amounts of gold we sometimes ingest with our food can influence the body’s metabolism and nervous system positively. • against all kinds of pain, skin diseases, chronic illnesses, wounds that won’t heal, and other ailments. 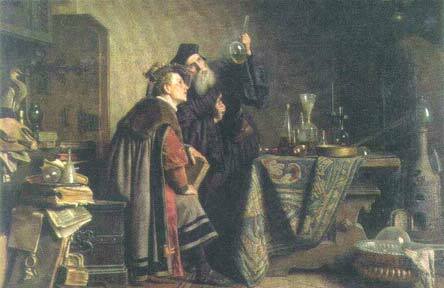 Still, the effects of drinkable gold described by Paracelsus and others go far beyond that. Their knowledge about the preparation was lost, though, nd by the 19th century, at the latest, their reports were regarded as boundless exaggerations by medieval quacks or just plain charlatanism, although even today Paracelsus counts as the founding father of modern medicine. But the knowledge about an extraordinary medicine made from gold lived on in popular belief, and even today there are supposed “healing liquors” like “Danziger Goldwasser” (Danzig Gold Water) in which tiny gold particles are floating. Only recently, at the turn of the millennium in the summer of 2000, it became possible to decipher the coded medieval laboratory manuals. According to those a process over several months is needed in which the metallic gold is completely dissolved. Judged by modern chemical standards, this is only possible with the strongest acids. But centuries ago, alchemists had found a much simpler natural way through which it is also possible by means of a weak organic solvent – by means of the so-called “philosophical mercury”. What this actually means is kept strictly secret by the modern manufacturers, though. They will only say that the metal is actually dissolved. 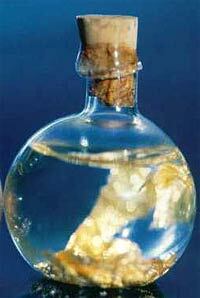 About 130 grams are needed to produce one litre of concentrated alchemistic Gold Essence. After the dissolution, over the course of several weeks, the liquid is being distilled, purified and exposed to the light of the sun and the moon as well as to planetary influences according to certain precise guidelines. The result is an alcoholic essence which contains just a few traces of the metal in an organic compound (as if a plant had metabolized it). Still, according to the symbolic alchemistic descriptions, it contains “the gold’s healing power”, i.e. “spirit, soul and purified material body of the sun metal” – in modern terms, the healing information of the gold’s body, soul and spirit. What’s actually the matter with this mysterious liquid has been investigated by the LIFE TEST Institute, a neutral institute for biophysical research. In cooperation with several technical colleges and therapists, chemical analyses and numerous tests from the field of alternative medicine were conducted, comprising Kirlian photography, measurements of meridian energy, and biophoton measurements (“biophotons” is the technical term for the light emitted by the DNA, the genetic substance, in our cells that regulates our metabolism). The result: even with external application the “Aurum Potabile” stimulates life energy, the “Chi” of the acupuncture meridians. People become more vital, their powers of self-healing are strengthened, and they simply feel great. These findings were corroborated by practical experience. At the “Privatinstitut für Naturheilweisen Arkanum“ in Bavaria, more than 70 patients have been treated up to now with Aurum Potabile internally or externally – with remarkable success: To an amazing degree, open wounds, skin diseases, inflammations, chronic pain states or a tumor in the ear got better only through Aurum Potabile (see sidebar). These patients had been treated before with current methods of orthodox medicine and naturopathy, but didn’t make any substantial progress. “Aurum Potabile will also greatly alleviate everyday ailments like headaches, belly-aches, indisposition or motion sickness”, “Arkanum” director Reiner Moll reports. Judging from Moll’s experience, Aurum Potabile actually does develop universal healing power, just as Paracelsus and others described it. Still, that doesn’t make it a miracle cure. Like many other natural remedies, it develops its most intense effects only when patients assist their own recovery by changing unwholesome life-styles. In addition, one should drink at least two litres a day of spring water or uncarbonated water low in minerals and eat healthy food as much as possible in order to assist the washing-out of wastes and toxins induced by the drinking-gold. Nevertheless it is unclear how the drinking-gold can actually bring about such profound harmonization. According to the alchemistic teachings the Aurum Potabile is supposed to stimulate three of the seven principal human energy centres: the root, heart and crown chakras (chakras are known in Alchemy as “seals” or “gates of the planets”). They are regarded as the principal energetic control centres.. Moreover, drinking-gold is said to cure by supplying “light energy”, by strengthening the natural order of body, spirit and soul and by stimulating awareness of deeper causes of disease. 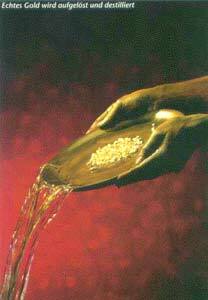 In alchemy, this process does not end with mere “repair” of an organism. Just like drinking-gold with its light energy drives away the darkness of disease in the body, it could “lighten” the whole personality – in modern words: it assists the development of one’s personality and awareness. Alchemists preserved the knowledge about such profound transformations in human beings in the form of symbolic images: as a transformation of “black lead” into “light gold”, which equals the legendary “Great Work”. Aurum Potabile was regarded as the most important tool in that process. Of course, there is no recent information about these spiritual effects. Only the positive influence upon the human body, mind and energy system have been documented up to now – but they are amazing enough.